If the only thing you know about carpentry is that it involves making furniture you’ll have a hard time finding the perfect gift for a carpenter friend or family member. But we have a few ideas that can help you find something nice that they’ll appreciate. They include unique practical tools that will help them with their work and personal or funny gift ideas that are bound to draw a smile of appreciation. 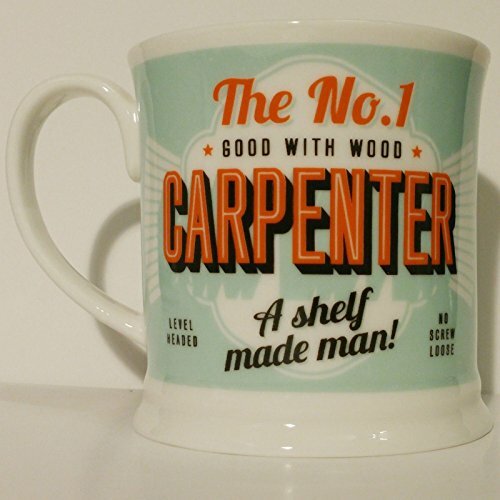 Whether you are late buying a birthday gift or you are a secret Santa, any of these is perfect for a carpenter. This is one of those gifts that are perfect for people who are hard to buy for. If you have no idea what tools or gear they’d appreciate, go for something like this Nuts and Bolts Carpenter man. It consists of a man in his workshop with an array of tools in front of him. 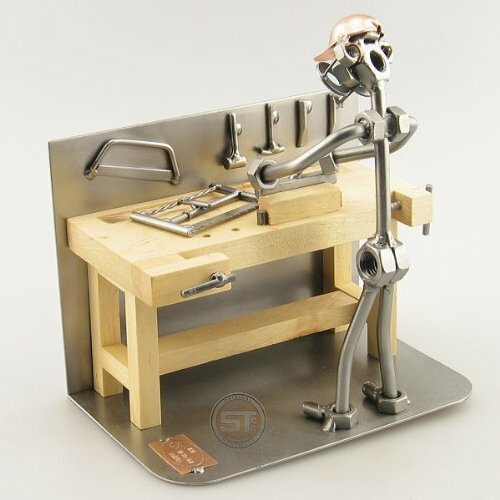 The man is made from Nuts and Bolts working on a wooden table. It has a nice rugged look to it that any carpenter will appreciate. It’s hand made in Germany with intricate precision and the best quality materials. Everything looks solid and very realistic. It makes for a thoughtful and personal Valentine’s Day, Christmas or birthday gift. If you are looking for a good and safe practical gift, this one is as good as any. While they probably don’t need another hand plane or tape measure, no one will turn down an extra workshop apron. 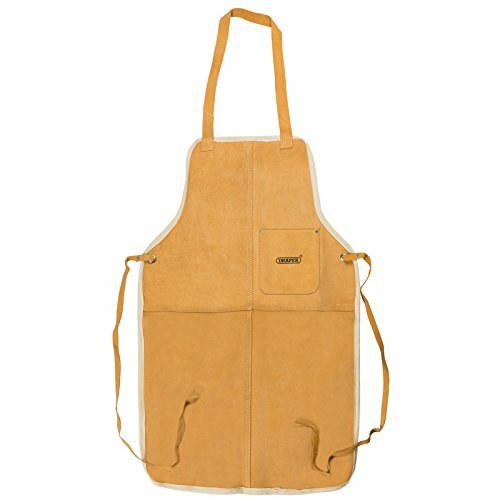 The apron is made from split suede leather which feels soft yet is tough and durable. It will withstand all the rough and grime of a workshop for years. It’s also ideal if they also dabble in welding. Each side is 70cm in length, which is long enough for most people. There is a wide neck loop that sits comfortably around the neck. A front pocket is handy for storing tools and small items while waist ties provide a secure fit around the body. The straps are long enough even for someone with a wider girth. Practical gifts are perhaps the hardest to get especially for someone in a specialised field like carpentry. It’s difficult to know which tool they’ll really appreciate and will be truly helpful. But you can’t go wrong with this multi-purpose pocket tool. It’s an 18-in-1 wallet-sized tool that is handy for everything from measuring to survival. It’s smaller than a standard credit card at only 3.34 inches long and 2.1 inches wide. It can be easily carried in the wallet or pocket. The card tool includes some important functions such as letter opener, ruler, 4 screw drivers, an Allen key set in 6 sizes, bottle opener and fruit peeler. There is also a box opener, a cell phone stand and a can opener. It will be helpful both in the workshop and outside. It’s perfect as a Christmas, birthday or Valentine’s gift. This is another great practical gift that you can almost be sure they don’t have but would really appreciate. It’s a magnetic wristband designed to hold tools and small items like nuts and screws. The band contains 10 strong neodymium magnets that securely hold any metal tools from hammers to screw drivers and small metal bits that can lost easily on a large work surface. The band is made with a soft breathable mesh on the inside. This ensures it stays comfortable even when worn the whole day long. On the outside the wrist band consists of tough, durable and waterproof nylon. The band closes using Velcro and can be adjusted to fit different hand sizes. So don’t worry whether it will fit them. A shelf made man. Level headed. No screw loose. Yeah, it’s funny and the perfect gift for a friend who loves working with wood. Unfortunately you cannot have their name inscribed onto the mug but it still looks great. It has a nice retro look and is big enough to hold plenty of coffee to get them through a tough project. It’s a great choice if you are looking for a nice simple and inexpensive gift.